Hiring a better interior designer is a smart decision. If you have invested your money in your home or offices or any other aspect better. Interior designers are really serving a purpose for everyone. If you have no idea of where or how to start decorating your house or you have an idea. But, you can not decorate your home without the help of interior designers. 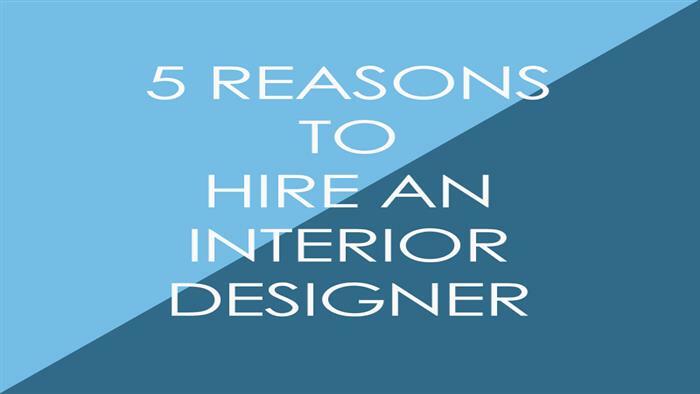 In this article, we are going to discuss about the 5 reasons why you should hire an interior designer. An interior designer is a combination of artist and engineer. As a designer, they can handle both concepts. The best interior designers have to be good with more than fabric, color and furniture. The interior designer should know the materials, budgets and maintenance of all objects. They must also know safety, electrical capacity and construction. Hiring an interior designer is not an easy thing, you must decide what your qualities are. The best interior designer has good experience in his field. They are professionally educated with relevant experience. In their studies, they can do several projects. Therefore, you can select these types of interior designers for your projects with ease. If you are hiring an interior designer, you need to check that they are (RID) Registered Interior Designer. These interior designers have the highest level of recognition. Interior designers prepare detailed plans for the space, showing materials, color scheme and lighting. The designer can provide detailed drawing and scale models to his clients. If customers want to show their materials, the designer should show some sample materials. Hiring someone to decorate your home would save you money to avoid costly mistakes. Not only is it helping you to save money, it also increases the value of your home. Generally When Selling Your Home - Interior design is important when listing your home. The best interior designer in Viman Nagar can help you save your money. An interior designer can keep your budget and save your effort and time. A designer knows where to go for the resources for everyone who is related to your home. This will save you time by researching products, prices and brands. As an interior designer, they will have all this at hand. If clients have an idea to decorate their home, offices, kitchen, etc., but they do not really know what materials are used and where to buy their materials. The most important thing is that they do not know the costs of the products. Hiring the best interior designers can solve all these problems. Related Links : interior designer in Aundh, interior designer in Baner, interior designer in Kharadi, interior designer in Hadapsar, interior designer in Koregaon Park.